The word 'Africa' is an evocative one that usually goes hand-in-hand with mental images of vast savannah plains dotted with exotic game. The majority of overseas visitors to Africa will go on safari, and in doing so discover that there is nothing more magical than a close encounter with the continent's famous wildlife. Most of the species one sees on safari are unique to Africa, and many of them are instantly recognizable. In this article, we take a look at ten of the continent's most iconic animals, including those that make up the African Big Five. To see a lion in its natural habitat is one of the most humbling, impressive sights an African safari can offer. However, whilst witnessing a kill is the ultimate prize, you're more likely to see one snoozing than in active pursuit of dinner. Lions spend up to 20 hours a day at rest, and are most active at dusk and dawn. They are the most social of all wild cat species, living in prides that typically consist of between five and ten adult lions. Tragically, lions are threatened by human expansion throughout Africa, with a 2015 paper prophesying that populations could fall by as much as 50% in the next 20 years. Best Places to See Lions: Head to the Kgalagadi Transfrontier Park on the border of South Africa and Botswana, or to Tanzania's Serengeti National Park during the wildebeest migration. There is nothing quite like the first time you see an African elephant in the wild. As the largest living terrestrial animal on Earth, their size alone is overwhelming; but many visitors also find themselves drawn by the elephants' tangible aura of wisdom. Elephants are found in a wide variety of sub-Saharan habitats, including forests, deserts and savannah. They are herbivorous, processing up to 990 pounds/ 450 kilograms of vegetation per day. Although most elephants are peaceful by nature, they can be dangerous if provoked; however, they are far more at risk from humans than we are from them. Best Places to See Elephants: Vast elephant herds roam Hwange National Park in Zimbabwe, and Chobe National Park in Botswana. As the tallest animal on Earth, you'd think that giraffes would be easy to spot on safari. However, their distinctive brown and white markings serve as exceptionally good camouflage, and it's not unusual for giraffes to simply materialize out of the bush just a few feet away. There are nine subspecies found across sub-Saharan Africa, all of which boast blue tongues, stubby horn-like protrusions on their heads and of course, outrageously long necks. In order to be able to drink without losing consciousness, the giraffe's neck contains special veins and valves that regulate the flow of blood to its head. Best Places to See Giraffes: Spot large herds of Masai giraffe in the Serengeti, or head to Murchison Falls National Park in Uganda to see the endangered Rothschild's giraffe. The elusive African leopard is a subspecies of leopard found only in sub-Saharan Africa. Despite its wide range, leopards are amongst the most difficult of all safari animals to see, as they are both nocturnal and exceptionally wary of humans. Leopards use trees as observation platforms and for protection, and that is where they are most often spotted during daylight hours. They are solitary animals with exceptional predatory skills, including the ability to climb, swim and drag prey weighing up to three times their body weight up into the trees. Leopards are classified as Vulnerable on the IUCN Red List. Best Places to See Leopards: South Africa's Sabi Sands Game Reserve and the South Luangwa National Park in Zambia are both famous for leopard sightings. The easiest way to identify Africa's two species of rhino is by the shape of their bottom lip - square for white rhinos, and pointed for black rhinos. The survival of both species is threatened by widespread rhino poaching, and the black rhino is considered to be critically endangered with fewer than 5,000 individuals left in the wild. White rhinos are more numerous and therefore easier to spot, especially in southern Africa. Shortsighted and usually solitary, rhinos are amongst the heaviest of all land mammals. An adult male white rhino averages around 5,100 pounds/ 2,300 kilograms. Best Place to See Rhino: Etosha National Park in Namibia is a rhino conservation success story, with a thriving black rhino population and a good chance of spotting white rhinos as well. The most slender of Africa's big cats, the cheetah is an exceptionally beautiful species known for its incredible speed. They are capable of short bursts of up to 70 mph/ 112 kmph, making them the world's fastest land animal. However, despite their speed, cheetah often have their kill stolen by other, more powerful predators. They are a vulnerable species with only around 6,600 individuals left in the wild, including a tiny population of around 40 individuals in Iran. Cheetah are found throughout southern and eastern Africa, in wide open spaces that allow them to reach their top speed while pursuing prey. Best Places to See Cheetah: The Maasai Mara provides ideal habitat for cheetah. Alternatively, track rehabilitated cheetah on foot at Okonjima Game Reserve in Namibia. African buffalo have a robust build and distinctive fused horns. They are grazers, typically moving in herds, with no natural predators except for lions and crocodiles. Unlike other species of wild buffalo, the African buffalo has never been successfully tamed, thanks to its naturally aggressive and unpredictable nature. Although seeing a buffalo herd ranging across the savannah is undoubtedly an unforgettable sight, it's important to treat these animals with respect. They are responsible for multiple human fatalities every year, and are considered one of the continent's most dangerous species. Best Places to See Buffalo: Katavi National Park in Tanzania is famous for its enormous buffalo herds. Chobe National Park is another good bet. Hippos are a common sight in the rivers, swamps, and lakes of southern and eastern Africa. Usually found in groups of up to 100 individuals, hippos spend the majority of their life in water, only leaving their aquatic homes to graze on the riverbanks at dusk. They have several fascinating adaptations, including webbed feet, large canine tusks and the ability to secrete a kind of natural sunscreen. Male hippos are territorial, and like buffalo can be exceptionally aggressive when provoked. Similarly, take particular care never to get between a hippo mother and her calf. Best Places to See Hippos: Zambia's Luangwa Valley is home to the world's largest concentration of hippos. The Okavango Delta in Botswana is also full of them. After the saltwater crocodile, Nile crocodiles are the world's largest living reptile, with the biggest on record exceeding 20 feet/ 6 meters. They are found throughout sub-Saharan Africa in a range of aquatic habitats including lakes, rivers and deltas. Crocodiles are well camouflaged when in the water, and are most often spotted sunning themselves on the riverbank. They have been around for millions of years, and with heavily armored skin and exceptionally strong jaws, they certainly look prehistoric. Nile crocodiles are perfect predators, employing ambush tactics to take their prey unawares. Best Place to See Crocodiles: Watch herds of wildebeest and zebra crossing the Mara River during East Africa's annual migration to see Nile crocodiles in action. There are three species of zebra in Africa; the plains zebra most commonly seen throughout eastern and southern Africa, and the rarer mountain and Grévy's zebras. Although they may look like domestic horses, zebras are almost impossible to tame; while their distinctive stripe patterns are as unique to each individual as a human's fingerprints. Zebras live on grass, and in some areas, form great migratory herds in order to seek out the best grazing grounds. During the migration, they often form a mutually beneficial relationship with another African species, the wildebeest. 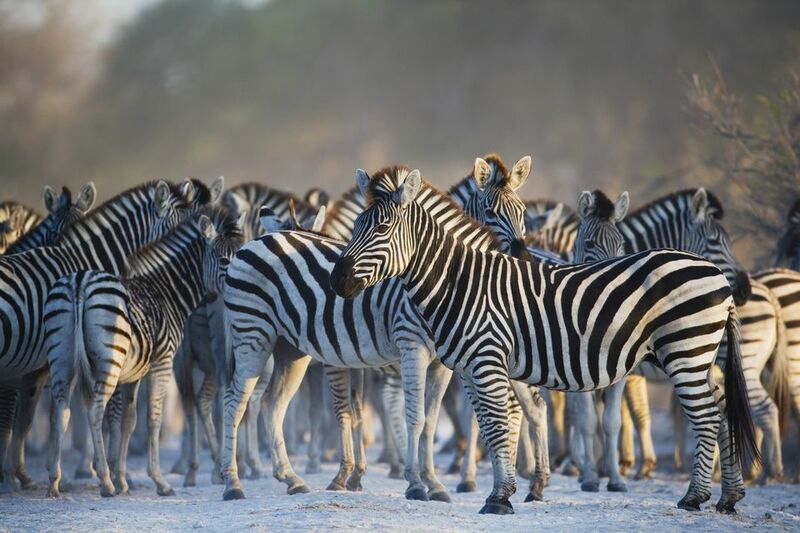 Best Places to See Zebra: For sheer numbers, you can't beat the Serengeti or the Maasai Mara during migration season. To see the endangered Grévy's zebra, head to Lewa Wildlife Conservancy in northern Kenya.